Posted November 25, 2015 by Bailey Heard & filed under Blog, FeaturedOnHomePage. Hello! Happy almost-Thanksgiving! Today, I was inspired to share how writing has been a tool to create more healing in my life. Throughout my 30 years so far, I have had over 20 journals. The earliest one dates back to the 3rd grade and is filled with my no-spaces-between-words writing I can now hardly read. No one taught me to journal, it was just instinctual, because while I consider myself to be an extremely empathetic person, I’ve always struggled to share my real feelings in person, out loud. While it’s a trait I strive to be more aware of, I know I’m a people pleaser by nature. This means there are times I feel one thing on the inside, but say another thing aloud because I think it’s what the other person wants to hear. It’s caused a lot of pain and confusion for me and for the ones I love. However, when I write, it’s like my words and my heart come into alignment, and I’m able to genuinely express what I’m truly feeling. Writing is where I feel like my most authentic self. I have no other voices telling me what to say, do, be, or think— just my own. Journaling continues to be the place where I can freely express my emotions and thoughts without judgment. I never saw writing as something I was good or bad at, it was just something I felt inspired to do often. Then one day I stopped writing. For whatever reason, this time period was after I got married. Three years into my marriage, right after Ellie was born, I was having a life coaching session with Christine Hassler. No one had ever said those words to me. My soul embraced them and I was determine to engage in my creativity. Within the next year, I picked back up on writing and created this blog, right before Andrew was diagnosed with cancer. 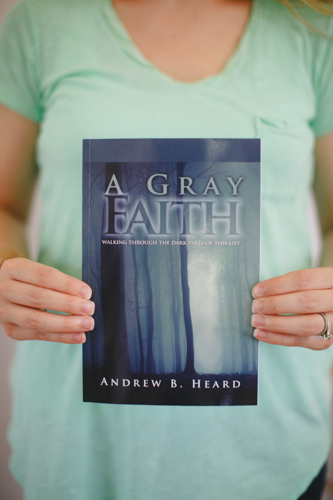 During Andrew’s battle for his life, writing became like breathing. I had to do it. I had so many different emotions bottled up inside of me, I needed to express them. When I write, I feel seen and heard, and my sincere hope is when I share my stories and experiences, I am connecting with and giving voice to those who feel the same way, and together we can find healing. Now my need to write and express myself has become my go-to for coping with all of the changes life brings. This past week was especially difficult for me because I had to make a decision that literally broke my heart. The pain felt like it was going to consume me. I had severe anxiety, but, as I prayed through the pain, I knew I needed to write. While my desire to revert back to my old ways of dealing with pain, by distracting myself with activity or covering my pain with anger, still arose, I was able to acknowledge giving into these old habits would only be a band aid. I knew every time I indulged in those distractions, the pain would still be there, buried deep inside me, and it eventually came out in some unhealthy ways. So this time I chose to feel the pain, trust in God’s plan, and address my emotions through writing. What do you do to help you address your feelings and work through painful seasons in your life? Please share in the comments below, because we are all created uniquely and everyone chooses different tools to use to work toward healing. In my experience, it’s been life-changing to have a tool such as writing to help give my emotions a voice so they feel acknowledged and not dismissed. Once I write them down, I feel immediate relief since I’m no longer avoiding what’s inside of me. In this way, I take a conscious step toward creating more peace and healing in my life. I really appreciate you spending time with me today! Hope you have a wonderful Thanksgiving with your friends and family. I’m so grateful for you! Blessings. PS – If you want Ellie and me to come speak and sign some Ellie Project books, shoot me an email at bailey@baileyheard.com. My speech is powerful, inspirational, and about living your legacy today! It’s good for men and women, corporate groups, mom’s groups, Bible Study groups, community groups, etc. Big or small, group size is of no importance. We are excited to come share this powerful message with you! PPS – The holidays are just around the corner! Looking to share the gift of learning the ABCs, as well as build lifetime character lessons with a special child in your life? To get your copy of The Ellie Project or The Ellie Project Stationery Set, click here!